Rafael Nadal says he will have to be patient as he prepares to return to action at the Chile Open after eight months out with a knee injury. The 11-time major winner begins his comeback this week in Vina del Mar. 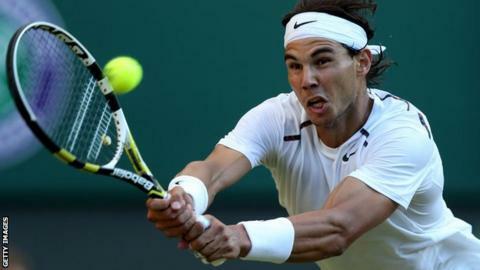 Nadal, 26, has suffered from tendonitis in his knee since his dramatic second round five-set defeat to Czech Lukas Rosol at Wimbledon in June. "I have to take it slowly and be humble to know that things won't be as good as they were before my injury," he said. "I need weeks of working on the circuit. I need to be patient. Hopefully I'll show an acceptable level. " The former world number one was forced to withdraw from the Australian Open after his recovery from his knee complaint was hit by a stomach virus. He also missed the London 2012 Olympics and the US Open. The Spaniard, who has slipped to number five in the world rankings during his absence, originally announced he would return at the Brazil Open on 11 February - but in January he brought his comeback forward a week. He is scheduled to play a first-round doubles match on Tuesday before his singles campaign begins on Wednesday. "Results are the least important thing right now," he said. "If my knee doesn't hurt, I have no fear. I've had had more serious injuries in the past and I got stronger after them.